The Filipino fast food chain Jollibee has become one of the world’s largest restaurant franchises, with more than 4,000 stores in 23 countries. Known for its fried chicken, sweet spaghetti and “Aloha burger,” Jollibee serves fast-food with a Filipino twist: The spaghetti, for instance, includes cheese and mini hot dogs, and the fried chicken is meant to be eaten with rice and gravy. Incorporated in 1978, the company started as a pair of ice cream parlors before adding hot meals to its menu when McDonald’s announced they were coming to the Philippines. The company now owns 14 global brands. In February, it acquired stakes in Smashburger and fast-casual Mexican chain Tortas Frontera, both U.S.-based companies. Dong added that Jollibee’s success in the North American market, as well as its other overseas locations, makes a huge impact on the Philippine economy. “Any success anywhere contributes to the company’s success overall and would make Jollibee at home more successful and endure a lot more things, in terms of their future expansion opportunities,” he said. 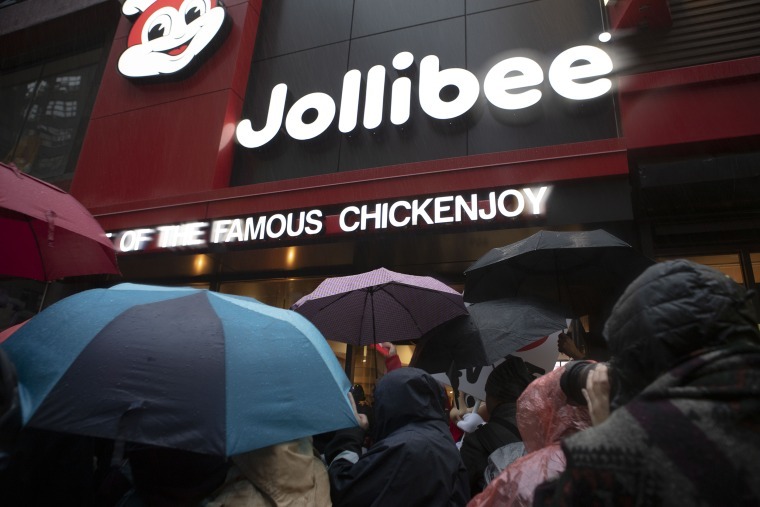 Jollibee’s most recent opening in New York City was highly anticipated, with some customers lining up for 20 hours. Dong said that the New York opening is a wise move in line with what some economists call the “dense market theory,” which suggests that when a franchise opens a location in an urban area with populations that reside and work in high-rise buildings, it increases the chances of one’s success because of that population density. Justin Callan from the New York City neighborhood of Coney Island said that, as a non-Filipino, he has always felt welcomed at Jollibee. He and his girlfriend, Faye, were the first customers in line for Jollibee’s Manhattan grand opening on Oct. 27. “All you have to do is open up the door and let the people smell it — that’s what got me,” he said. Jollibee executives hope to open 150 stores in the U.S. and 100 stores in Canada over the next five years. “This is our entry into the mainstream, not just Filipino, market — we are catering to a bigger spectrum, and want to keep strengthening our foothold both in the U.S. and globally,” Tanmantiong, the CEO, said. Dong said Jollibee also fares well with a younger, adventurous demographic. The curiosity to try new cuisines like Filipino food will draw in customers, particularly millennials, because pricing is cheaper in the fast food world, he noted. The way Filipino cuisine is served and enjoyed has evolved in recent years, some chefs and business owners say. “The option of getting Filipino food at a turo-turo joint, or in an upscale modern environment like our restaurant, or in a fast food setting like Jollibee, it’s good to see so much cultural presence for an often underrepresented population,” Sarah Mosqueda, who co-owns Irenia — a restaurant with Filipino influences in Santa Ana, California — with Chef Ryan Garlitos said, using the Filipino word referring to restaurants where customers point at what they want. “It’s appealing to Filipinos because its offering a little bit of home, and its appealing to non-Filipinos because honestly, who doesn't like fried chicken?” she said. Dale Talde, author of “Asian-American: Proudly Inauthentic Recipes from the Philippines to Brooklyn,” had a different perspective. Talde, who owns multiple restaurants, said that while he likes Jollibee and is glad to see the business grow, he doesn’t think people should go if they’re looking for authentic Filipino food. Jollibee executives say that the company hopes to provide overseas Filipinos a familiar taste of their childhood. Follow NBC Asian America at Facebook, Twitter, Instagram or Tumblr. CORRECTION (Dec. 6, 2018, 12:31 p.m. ET): An earlier version of this article misstated the amount of time some customers waited in line for a Jollibee grand opening. They waited for up to 20 hours, not more than a day. Saleah Blancaflor is a reporter for NBCNews.com.